A version of Alf Thompson’s Tractor by Character Options was first released in January 2011. The only earlier version of Alf Thompson’s Tractor is the much smaller scale ERTL Racing Champions die-cast carded version. 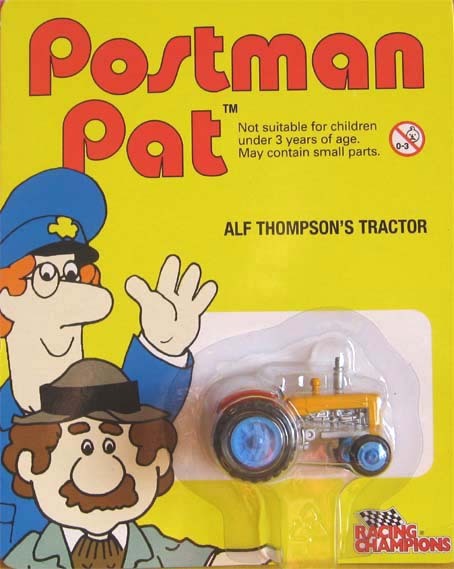 Its curious that Born to Play, in the Postman Pat Snap Trax range for example, never released Alf Thompson’s Tractor or the Alf Thompson figure. In Postman Pat Alf is married to Dorothy Thompson; they are farmers at Thompson Ground. Their son Bill Thompson goes to the Greendale School. Character’s Alf Thompson’s Tractor is a red push along tractor with a hinged basket feature for carrying a straw bale accessory. 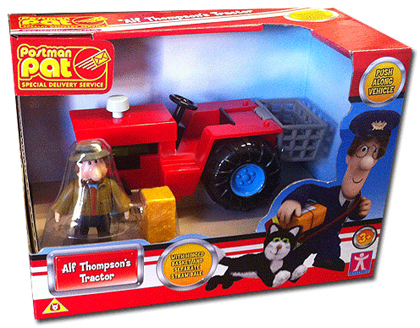 The boxed Postman Pat vehicle set includes the first release of Character’s Alf Thompson figure in trademark hat and brown jacket.